Today is BMW day. 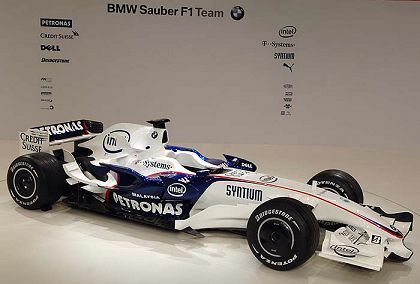 The big story is the unveiling of BMW Sauber's challenger for 2008, the F1.08. And it seems that I am getting into the habit of this being the only launch that I take much notice of. While other teams vary from McLaren's hire of Valencia last year to show off its MP4-22, to Williams deciding not even to have a launch this year, BMW stick with the sensible middle ground with a low key but impressive display in Munich. It is so much in keeping with the no-nonsense ethos of the team. You can watch a video of the launch by hitting the Live Stream link on the BMW Sauber website, itself a demonstration of how to advertise yourself on the net, and there is a steady flow of photographs of the car appearing on all the usual sites and blogs. At first sight, the F1.08 looks very much the same as last year's car but closer inspection reveals changes that might be quite significant. The car is slimmer both front and rear and the aerodynamic details more complex. Like all the other teams, BMW assures us that the front wing and other aspects will change before Melbourne so already we are into the hectic pace of development that is F1 during the season. In essence, the car looks like what it is: an evolution of last year's car, retaining the best aspects while correcting previous mistakes. No risk involved, just good, solid development. And that is what we have come to expect from this team, understatement rather than hype, realism rather than hyperbole. They are aiming at a race win this year but I think they have the potential for many more than that. It is now almost a tradition that they exceed their goals for the year and, if they continue in that vein, the wins will start to flow. Always, at this point, someone mentions Nick Heidfeld's lack of credibility as a winner. There are two reasons for this: he sports a beard and he has not yet won a GP. Both reasons can disappear in a moment and Nick be revealed as the champion who was overlooked. I have complete confidence that he can do it and don't believe that you have to look like a champion to win races. Heck, Massa has won races and he hardly looks the part. And talking of Massa, Nick himself has no qualms about having to beat him and the other stars of F1. In an interview with Bild newspaper, he had this simple fact to refer to: "I know that in the past I have beaten every one of them." It's true and Nick has a quiet determination that will compensate for his apparent lack of showmanship. So what of Kubica? He has a flair that Nick seems to lack but he also has still to prove himself the quicker of the two. That proved an impossible task last year and will be just as difficult in the coming season. This morning I saw a comment somewhere about Marko Asmer being chosen as a BMW Sauber test driver and Heidfeld having to watch his back as a result. But I would say that it's young Kubica who needs to be looking over his shoulder, not Nick. Am I right, Heikki? Whoever comes out on top, it's a good driver pairing. Both want to win and yet are sensible enough to know that the team is a priority. The gap to Ferrari and McLaren may have looked insurmountable last year but I suspect that it will have disappeared in 2008. BMW may not have sprinted ahead of the top two but they will be contending for wins, I think. And, if there is any justice in the world, Nick Heidfeld will be the most unexpected champion for years. I too have a respect for Heidfeld. I talked about it last year (Heidfeld: A Certain Amount Of Respect), but my words are just as relevant today. And unlike Honda of the past, or Midland/Spyker in their day, BMW don't do hype, and that in itself is refreshing. It must relieve some of the pressure, but I believe they add it back on themselves. I truly hope BMW can win, and I hope Nick can be the one who does it for them (initially, at least). Much as i would be happy as you both in seeing BMW or any other "new" team winning, I have a feeling that this season is going to be a repeat of 2004 season with Ferrari running away with the titles and wins while others like Mclaren,BMW and Renault fighting for the leftovers. I predict a single win for Renault courtesy Alonso showing the same kind of brilliance we saw from JPM in Brazil 2004 and a win for BMW too. There are many who would agree that this year will see Ferrari trounce the rest, Uppili, but I don't think so. This is when the change in personnel will really begin to bite and we will see even more unreliability and panic in the Ferrari pit than in 2007. Having said which, I am aware that the car has shown well in the first day of testing at Jerez but, as the saying goes, it is early days yet. We shall see. I'm glad you mentioned how compact the BMW is - the others seem to sprawl off into the distance in comparison. And that's what I especially like about the car - it is tight, compact and businesslike. Surely a good sign for the season. I think it will be a McLaren/Ferrari season. I really don't understand why people are writing off McLaren. There is not a shred of evidence to do so. I have no doubt Heidfeld is capable of winning races. He is unlucky not to have driven better cars and had it not been for the sudden and unexpected rise to prominence of Raikkonen at Sauber Nick would probably have been given a McLaren drive. I thought Heidfeld's behaviour at the launch seemed to suggest some kind of problem between Kubica and himself. It may be that he has had one you team mate go on to greater things and so is reluctant to praise Kubica too much in case people think that he believes Kubica is another Kimi. BMW's biggest problem by the sound of things at the launch could be gearbox reliability. This season they have to do 6 times the mileage they did last season and they had problems last season. The gearbox issue was sorted last year, I think. All their problems with it were in the early races and after that they were very reliable. You could be right about Heidfeld's feelings regarding quick team mates but, as I mentioned in my article, Robert needs to become a little quicker to seriously discomfort Nick. Of the two, I back Nick to come out on top (if he doesn't, I can see Germany invading Poland again...). Well, I can dream, can't I? I too, hope for something other than a McLaren/Ferrari dominant season. I'd love for BMW or Renault or even Red Bull to be at the pointy end of the pack. And a Williams resurgance would be great too - Rosberg is another driver who is well deserving of wins and, given a better car, could be a serious contender for WDC. "...itself a demonstration of how to advertise yourself on the net"
well i can view this one on a mac, which is one up on toyota's launch. I think the BMW Sauber site is the best of the F1 teams', Sidey. It's clean, clear and easily navigated with plenty of multimedia goodies that you can turn off, however, if your computer can't cope. Masses of good information, too. What more could you want? And it's YouTube to the rescue again, Alianora! How did we ever manage before it came along? Every manufacturer is in F1 for one reason, to improve the image of their road cars. BMW has done this better than anyone. If I were to buy a car purely based on the image created by the F1 team it would be a BMW. I don't see why so many people can paint Button a future champion but write off Hiedfeld. What if McLaren scooped up Hiedfeld instead of Kimi? He was faster when they were in the same car. For my money Nick did the most with the least this past year, its hard to gauge how close the BMW was to the front runners, but when it counted Nick was able to hold back the front runners with a slower car, not to mention his pass on Alonso in Bahrain. It seems to me that Heidfeld may well be a talent that has been waiting for its moment and this coming season looks like it could be the one.